Books that reflect on the theory of art are not common on the international publishing circuit. Those that really help to enrich a productive understanding of today’s art are even less common. What does abound, in magazines and other media including the Internet, are critical approaches to artists and contemporary works, which tend, more often than not, to repeat the successful ideas of a few thinkers, without being particularly concerned just how different the facts under consideration may be. The leading ideas pertain to whichever philosopher is in fashion, pigeonholed against his will by the apocalyptic intellectual tradition of the old left, which without having developed an adequate grasp of the motivations or the discursive and operative strategies behind the art du jour, proceeds to diagnose its health, with greater mistrust than depth, in an inevitably vain attempt to emulate the basic impulse that led Kant, to write his brilliant Critique of Pure Reason over two hundred years ago. 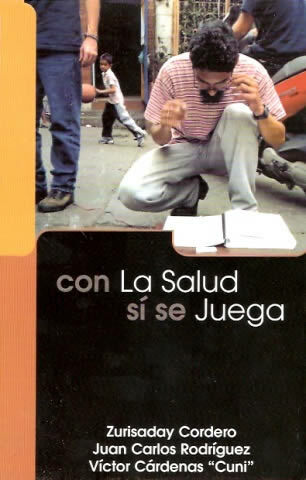 I would like to point out an initial characteristic of Con la salud sí­ se juega (Don’t Take Your Health Seriously): it deals in depth with an action (or set of actions) involving community work carried out in 2000-2001 in the La Plazoleta (1) barrio in central-south Caracas with the aim of fostering “a discourse- and metaphor-related exchange”designed as much to empower and vindicate the community as to engage in art work. I should add a second characteristic: although the book examines “an experience”stemming from the concerns of a psychologist, Zurisaday Cordero (b. San Juan de los Morros, 1965), interested in “stimulating public discussion concerning the relationship between communities and health-care institutions, using psycho-social, artistic and people-oriented strategies to promote the right to health care and foster civic involvement in this sector”(p.44). The work process used to attain those aims was led by a team composed of Cordero and two other main players: a community leader, Ví­ctor “Cuni”Cárdenas (b. 1959), and a visual artist —Juan Carlos Rodrí­guez (b. Caracas, 1967). Each helped to shape the actions and provide the food for thought behind their development. Prompted by a desire to create context-based art in conjunction with non-artists - the inhabitants of the barrio in this case - Rodrí­guez was in charge of theorizing the project’s art strategies, or rather, combining “the artistic”, empowered by strategies from other disciplines, with practices of everyday life. Those ideas are set forth in the book, which in addition to the foreword and prologue —both written by Zurisaday Cordero and Juan Carlos Rodrí­guezâ€”contains five texts: “Creative practices: Trans-disciplinarity and Involvement”and “The Tournament: Crux of a Network of Undisciplined Knowledge”, by Juan Carlos Rodrí­guez; “The Traveling Bed”and “Naked Health or How to Politicize Health Care Through Creative Practices”by Zurisaday Cordero, and lastly “The Awakening of Communal Love”, a transcription of a talk by the three authors.